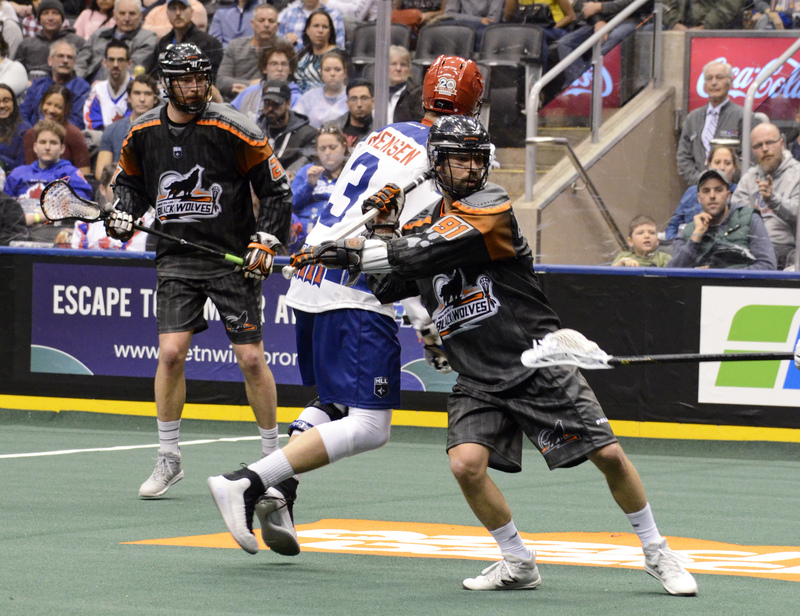 The New England Black Wolves are back on track after Kevin Crowley’s overtime goal gave them an 8-7 win over the Toronto Rock on Sunday afternoon at Air Canada Centre. 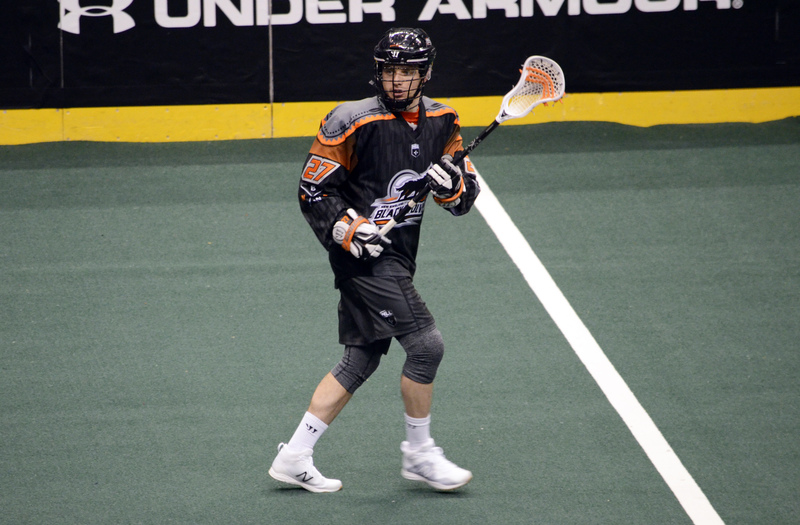 The Black Wolves are resurging after three big losses and some roster moves that included shipping Shawn Evans to Buffalo a couple of weeks after he was stripped of his captaincy. New blood in the lineup has included Johnny Powless, acquired from Georgia, and Callum Crawford, who came over for Evans. Crawford had a goal and two assists in his debut on Sunday. 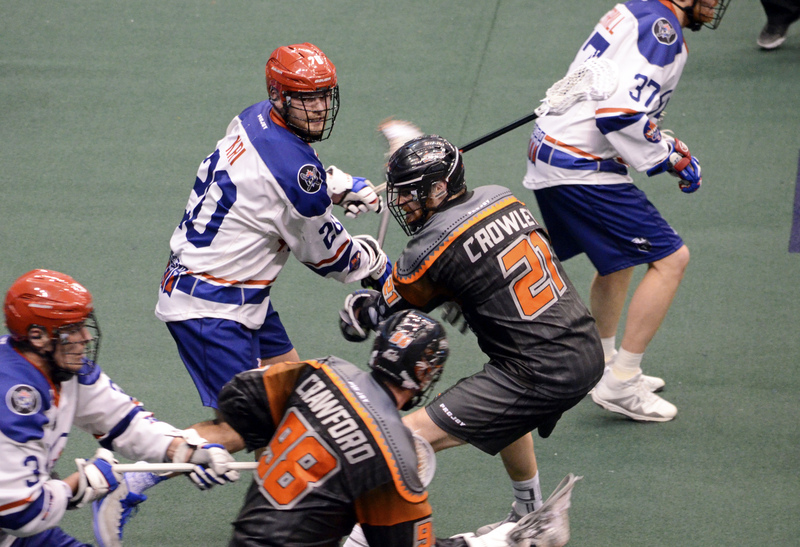 Whether the roster changes or just a renewed sense of team pride, the Black Wolves are now on a two-game winning streak, having picked up a 12-11 OT win last week over Vancouver. Kevin Buchanan, who had a first-quarter hat trick, agreed that it’s a credit to his teammates for the way they have turned things around. 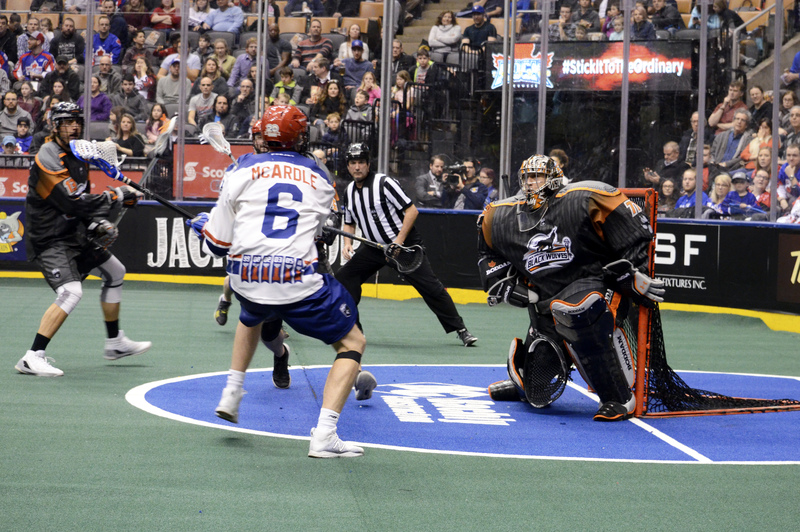 Rob Hellyer scored 28 seconds into the game to give Toronto an early lead. Buchanan tied the game at 7:08 and then scored shorthanded at 9:39. He capped off the hat trick at 14:47. New captain Kyle Buchanan scored with an extra attacker with one second left in the quarter for a 4-1 lead, much to the surprise of the 10,259 fans at the ACC. Brett Hickey scored on the power play at 5:51 of the second quarter to cut into the lead. Kevin Crowley, Challen Rogers and Crawford then traded goals for a 6-3 lead. Reid Reinholdt gave the Rock some momentum heading into the halftime break with a goal at 14:56. Crowley said the atmosphere was akin to a playoff game. “When you face conference opponents in the second half of the season, the stakes are a lot higher,” he added. Brock Sorensen scored the only goal of the third quarter, breaking the 13-minute drought after he grabbed the rebound from his own shot, ran behind the net and used his 6’6” frame to jump and dunk the ball in the net from behind. Aside from that goal, both Nick Rose and Aaron Bold had strong quarters – really, strong games overall considering the low score. They each made 51 saves throughout the game. Down 7-6 late in the fourth, the Rock took possession on a power play after a backhand attempt by Crowley bounced off Rogers’ helmet. The Rock called timeout and before the penalized Black Wolves’ player had a chance to get back in the play, Hickey had cut to the shooter’s position and fired a rocket past Bold to send the game to overtime tied at seven. Crowley, who maneuvered a shot around his defender at 2:08 into overtime to pot the winner, said it felt awesome. Kevin Buchanan echoed Bold’s thoughts on the excitement of the game. Sunday’s win puts the Black Wolves a half-game ahead of Buffalo for first place in the NLL’s east division. They’re looking to extend that lead tomorrow as they host the Rock in the back half of their home-and-home series. The winner will hold the tie-breaker against the other should playoff positioning come down to that. Buchanan and Crowley each had three goals. Stephan Leblanc had four assists. The Rock’s third loss in-a-row drops them to fourth place and half-a-game back of Rochester for the last eastern division playoff spot. Toronto’s offense has struggled since losing Tom Schreiber, and the club even scratched Dan Lintner on Sunday, looking for a spark as they dressed only two regular righty forwards in Rob Hellyer and Brett Hickey, with Phil Caputo up from the defense. Leading scorer Adam Jones was held pointless after only picking up two assists last week. The Rock have to be disappointed with their lack of overall offensive production, considering how well Nick Rose and their defense have played. Hellyer (2G/3A) led with five points, while Hickey contributed two goals. Challen Rogers had one goal and one assist. Game time on Friday is 7:30 p.m.